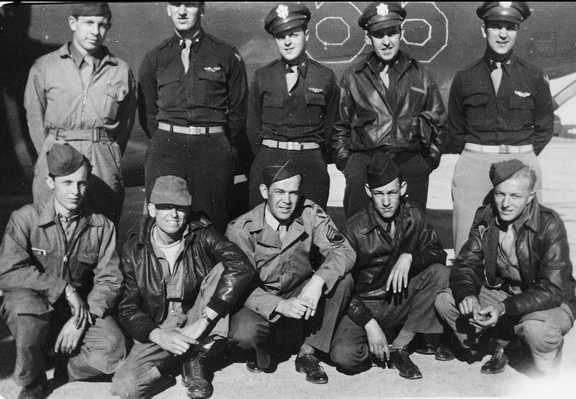 Front Row Left to Right: Albert Ross (tail gunner), Ellis Cates (gunner), Paul Gleeson (crew chief & top turret), Sidney Coates (gunner), Anthony Jansma (Ball turret gunner). Identifications by George Bursik. Comment by Lorin McCleary (son of Lorin McCleary in this photo). My father, Lorin McCleary was assigned as first pilot on another ship once the men reached Lavenham and he was Killed in Action on the 11-May-1944 mission when the aircraft was hit by flak over Chateaudun and exploded in mid-air. I understand that Albert Ross was also later lost in action.